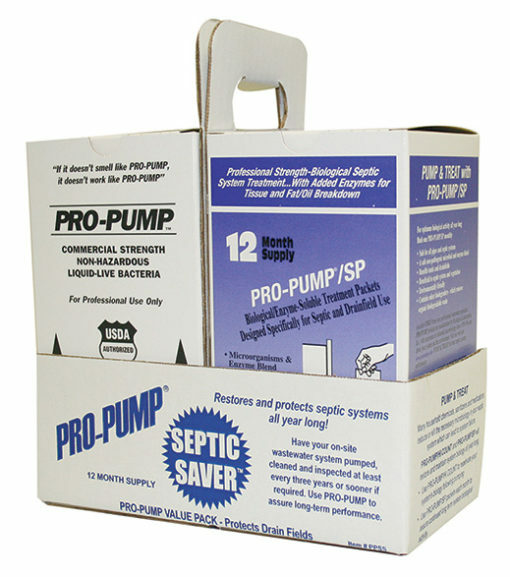 Pro-Pump Septic Saver - T.W. Ammons Septic Service, Inc.
Pro-Pump Septic Saver Is A Septic Tank Treatment That Protects Your Septic System From Failure & Ensures Continued Problem-Free Service Year-After-Year. Pro-Pump Septic Saver is a simple tool you can use, combined with regular maintenance, to protect your system from failure and ensure continued problem-free service year-after-year. Your on-site wastewater system relies on microorganism to breakdown, degrade and remove organic matter. Unfortunately some slow to degrade organics, household chemicals, sanitizers and medication can deplete or kill the essential microorganisms within your wastewater system. Should this happen, organic matter will build up at a rate greater than the natural biological removal of system microorganisms, resulting in potential system failure. Pro-Pump Septic Saver is a combo pack of our two best selling septic treatments: Pro-Pump / HC and Pro-Pump / SP. This 1 year bundle is packaged as a monthly treatment program. The kit is designed to insure a high rate of biological activity and oxidation of the waste matter within your system, as well as assure the rapid breakdown and removal of waste matter that can build up in drain fields. By speeding up the rate your system degrades waste matter, there is less chance of system failure. Pro-Pump Septic Saver is a special combination treatment of environmentally safe biological products in liquid (1 Quart bottle of our Pro-Pump / HC) and ready to use packets (12 monthly Pro-Pump septic packets). These two bio-formulations will reduce odor and break down solids in lines and tanks. They will also work alongside the naturally occurring bacteria in your septic system. Together, the naturally occurring bacteria and Pro-Pump will break down slow to degrade waste products like toilet paper, grease, fats, and oils that cause problems in your drain field. 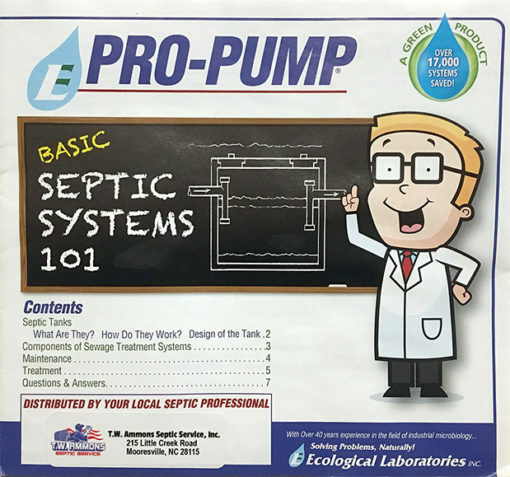 x1 Septic 101 & Pro-Pump High Count Q&A Booklet – Instructions, Questions and Answers, with Tips on Maintenance & Service. Professional Strength-Biological Septic System Treatment with Added Enzyme for Tissue and Fat/Oil Breakdown! 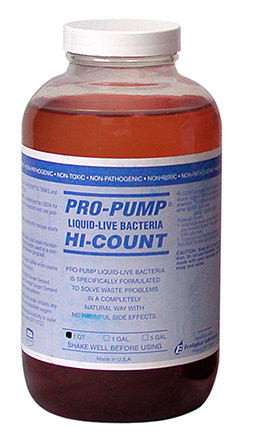 Pro-Pump / High Count is a live liquid culture concentrate, designed for use after pumping your septic tank to recharge your entire septic system. It is non-toxic, non-pathogenic, and is safe for plants, animals, and people. The use of Pro-Pump / HC restores essential microbial activity in your system following pumping. Pro-Pump Liquid-Live Bacteria is specifically formulated to solve waste problems in a completely natural way with no harmful side effects. Pro-Pump / HC is comprised of several biological strains, some of which are aerobic, and some anaerobic. The culture will work efficiently in either light or dark areas. ~ Reduces Hydrogen Sulfide which creates strong, offensive odors. ~ Reduces Biological/Chemical Oxygen Demand that causes pollution. ~ Works under virtually any range of pH and dissolved oxygen. ~ Continued biological activity in water temperatures under 55 deg F.
Since each bottle of Pro-Pump is grown individually, color variations may exist from bottle to bottle. These variations in color are not indicative of variations in product quality. Shake well before use. Any floating particles present are suspended biofilm which slough off the sides of the bottle. Dimpling or expansion of the container is caused by pressure differences resulting from temperature variations due to the fact that the bottle is sealed. 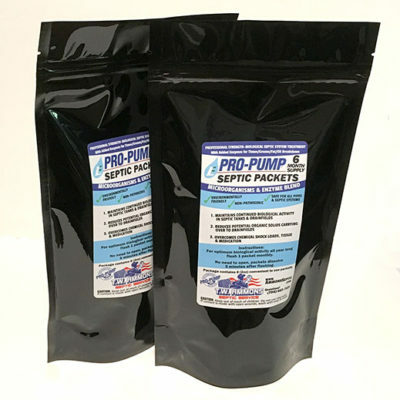 Pro-Pump Septic Packets are commercial strength, water soluble packets of dry spore based, non-toxic, non-pathogenic bacteria and enzymes. It is designed for homeowners to use to assure continued essential biological activity all year long. Use in conjunction with PRO-PUMP to assure long term system performance and significantly reduce potential system failure. Pro-Pump / SP bio-enzymatic formulation provides continued high rate microbial activity (when used on a regular basis) assuring long term system degradation performance. Pro-Pump / SP is a monthly treatment and contains special enzymes to breakdown organic and inorganic solids. A safe non-pathogenic microbial and enzyme blend that is environmentally friendly. It is safe for all pipes and septic systems. Contains select biodegraders that remove organic waste, reducing potential organic solids carried over to drain fields. 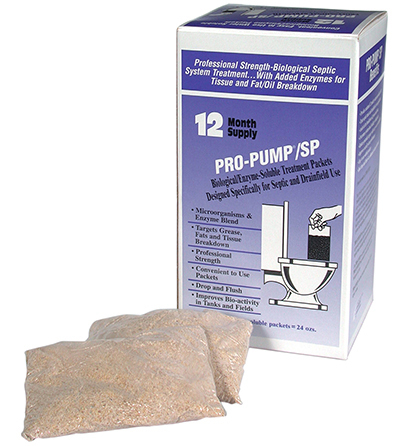 Using Pro-Pump Septic Packets couldn’t be easier with convenient, easy to use water soluble packets. Simply Flush One Pro-Pump / SP each month. No need to open the package, as it dissolves within 5 minutes after flushing. Also remember that for optimum septic system protection, get your septic tank pumped and maintenanced regularly. PRO-PUMP is the best insurance money can buy for your septic system. Toilet tank leaks, even small ones, can cost you more on your monthly water bill and potentially overload your septic drain field. These water test tablets are designed to easily and effectively catch toilet tank lids. Even if you cannot hear or see a leak, your toilet could still be leaking. STOP THE DRAIN ON YOUR DOLLARS! 4. Blue color appearing in bowl means there is a leak. In most cases, a leaky toilet can be fixed by replacing the toilet tank’s internals, such as the flap. Ask your local hardware store or local plumbing professional if you need assistance. Keep Pro-Pump Septic Saver out of reach of children. Do not use internally. If contact is made with open wounds, wash with soap and water. Available from your professional septic repair specialist, T.W. Ammons Septic Service. 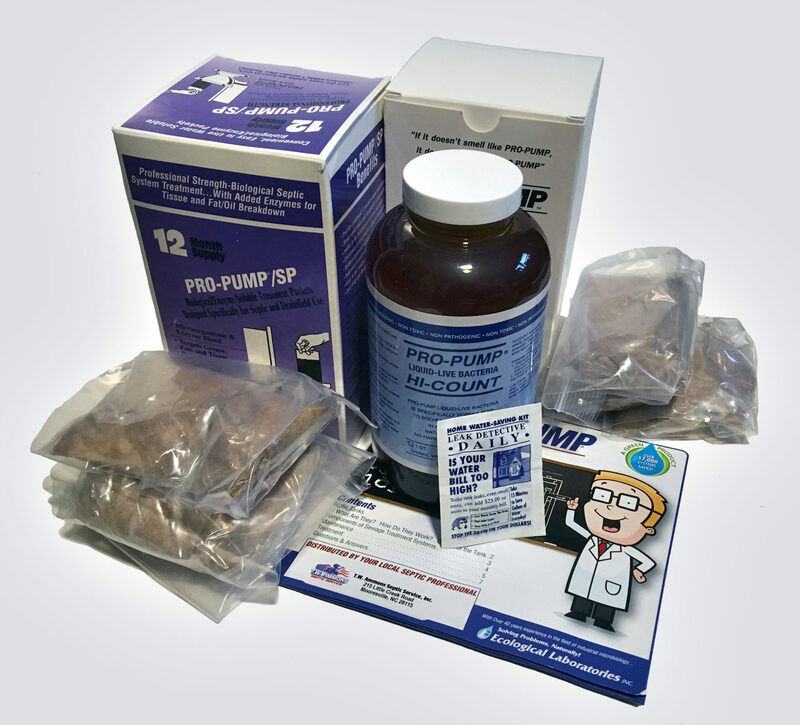 Pro-Pump products are manufactured by Ecological Laboratories, Inc., with experience in industrial microbiology since 1976.